tRNAs are heavily decorated posttranscriptionally with numerous chemical modifications, which are essential for shaping up, fine tuning, and regulating all aspects of tRNA functioning. These chemical modifications are dynamically regulated and catalyzed by tRNA modification enzymes. Mutations or dysregulation of tRNA modifiers have been associated with diseases. The emerging importance of tRNA modifications in diseases calls for additional work[2, 3]. 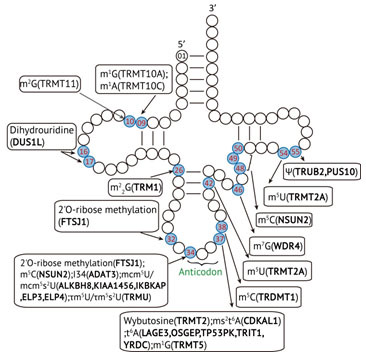 How tRNA modifications are regulated by tRNA modification enzymes is in need to be studied. To help researchers quickly and conveniently profile enzymes involved in tRNA modifications, Arraystar has produced the first commercial PCR panel specially designed for profiling the tRNA modification enzymes. The panel contains 85 validated or predicted tRNA modification enzymes or protein factors compiled from research publications and authoritative databases including UniProt and Modomics, partially illustrated in Figure 1. • tRF&tiRNA Sequencing Service New!